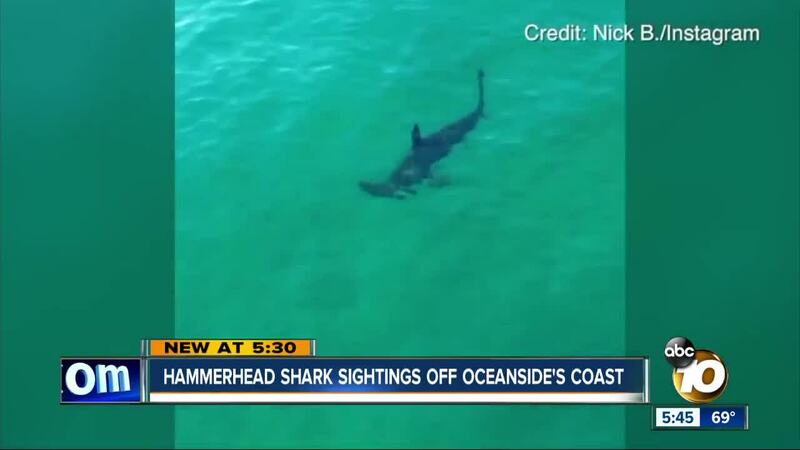 Hammerhead shark sightings off the coast of Oceanside are on the rise. SAN DIEGO (KGTV) - Experts at bringing customers up close and personal with whales and dolphins, Oceanside Adventures says in recent weeks they've had more luck spotting sharks off Oceanside's coast. "We've been seeing just about every single day, sometimes multiple sharks a day," said Captain Shane Hansen. Hansen says they keep track of shark sightings and he estimates they've seen triple the amount compared to last year, mostly hammerhead and mako sharks. Shark researcher Ralph Collier says hammerheads are typically found in Baja but that their territory is expanding with the warmer waters. He says they come up north to feast on bat rays and will stay here until the water temperature cools down. Oceanside Adventures captured footage of recent shark sightings with help from a Go Pro and drone. Hansen says their shark sightings have been a safe distance from beach-goers, one to four miles offshore. So far he's only had to alert lifeguards once to a shark approaching too close. Last month lifeguards did shut down the beach for a short time after spotting a 9-foot long hammerhead 100 yards offshore.